October 06, 2014, 6:18 p.m.
Daily deal sites like Groupon have been struggling to define their business model and turn a profit. Although 39% of Americans have used “daily deal” sites only 29% think that they are worth the money. 43% of those how have used a service have flat out forgotten to use the deal that they have purchased. Just over one third (34%) say they have had a sub-standard experience with an online deal. One potential target, however, may be New York women and people living in the highly populated borough of Manhattan. Women in general and New York women in particular seem to be most susceptible to the “daily deal.” Nearly half of New York women (49%) have used a deal site compared to the general population of American women (43%), and 36% of NY women think they are worth the money. 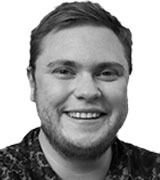 As residents of the most populous and densely packed community in America, New Yorkers are, by necessity, active participants in the service culture. The majority of New Yorkers don’t own cars and many properties don’t allow laundry equipment inside the apartments so it is no surprise that New Yorkers regularly use taxis (24%), laundry services (17%) and dry cleaners (27%), which in some neighborhoods are on every block. In Manhattan the numbers are even more striking. 46% regularly use taxis and 40% regularly visit or send their clothes to the local dry cleaners. With so few cars 13% of New Yorkers (22% in Manhattan) also order grocery delivery compared to only 2% of Americans in general. 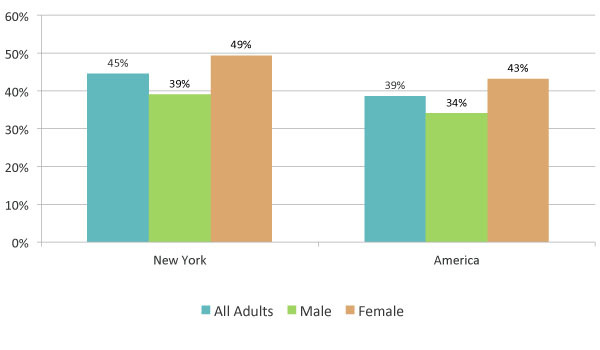 New Yorkers are enthusiastic consumers of fitness and beauty services. 17% of Manhattanites have a regular massage, while 10% use a personal trainer – a much higher rate than the general population. 13% of Manhattan residents regularly visit a dermatologist compared to only 4% of the American population, and a quarter (24%) regularly have manicures and pedicures compared to only 9% of the general population. There is however one deal that New Yorkers would really like to see – and Uber may have cornered the market. A quarter (24%) of Manhattan residents would like to be able to access a Groupon deal for taxi fares as would 15% of New Yorkers. 22% of New York women and people in Manhattan say they would take a deal on massages. 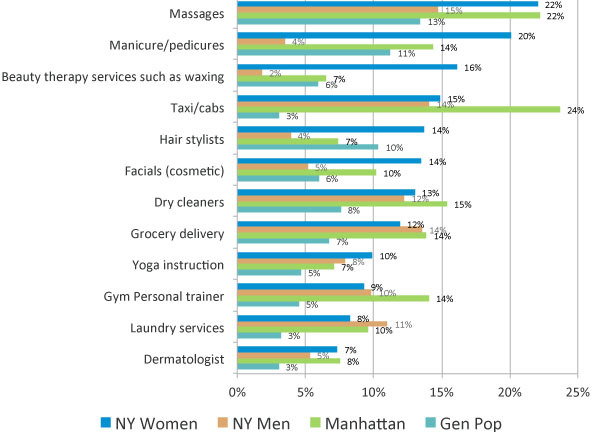 New York women are also keen for deals on manicures (20%), beauty therapies (16%) and hair stylists (14%). Which of the following services would you be interested in purchasing on Groupon? For further information about poll results, and for details about methodology and omnibus services, please email omnibus.us@yougov.com.